Manufacturer of a wide range of products which include muffle furnaces. 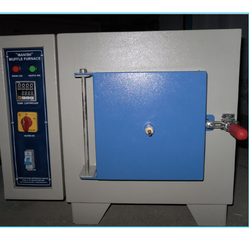 We are a manufacturer, supplier & dealer of Laboratory Muffle Furnaces. We are highly proud to offer a wide gamut of muffle furnaces, laboratory muffle furnaces, Industrial Muffle Furnaces, mild steel muffle furnaces which can be availed in various specifications and designs. Our products are appreciated for their quality, durability, strength, reliability and sturdy construction. These furnaces are developed by making use of superior grade stainless steel are suitably mounted on muffle. This range is rendered with the low mass thermal insulation and is utilized in ashing organic & inorganic samples, ignition tests, gravimetric analysis of chemicals and determination of volatile & suspended solids. Time proportionate digital temperature controller with an accuracy of +/-2OC. Note: Technical details can vary according to the model.